Observation - Jonathan - Two winged fly (Diptera) - 22 July 2008 - 3:50pm - UK and Ireland. 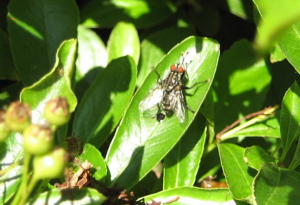 Description: Pretty ordinary looking fly, but I wonder what it is? I know flies are difficult, but is it possible to say anything from a picture like this? Pretty ordinary looking fly, but I wonder what it is? I know flies are difficult, but is it possible to say anything from a picture like this?